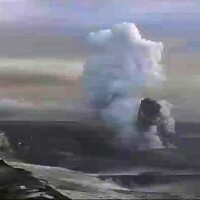 In this image from television a plume is seen rising from the Grimsvotn volcano in Iceland. Professor Sir John Beddington will head a peer review group to improve the way the country deals with any future volcanic ash clouds. The Government has appointed an ash "supremo" to improve the way the country deals with future volcanic eruptions. Transport Secretary Philip Hammond announced that Professor Sir John Beddington, the Government's chief scientist, will head a peer review group that will analyse sources of data on ash concentrations. Mr Hammond said the newly-formed group will work on improving the current Met Office "model", which came under fire from budget carrier Ryanair following the recent Icelandic ash cloud crisis. Disruption caused by the eruption of an Icelandic volcano also highlight the importance of having an adequate travel insurance policy in place. Addressing a European Civil Aviation Conference meeting in London, Mr Hammond said it is possible to obtain more-accurate outputs on ash cloud movements only if the input data for the model is improved. He said the country hoped to reach a broad international agreement on the revised approach to ash cloud problems soon.